Growthdeck | Vote for Growthdeck for the People’s Choice Award . 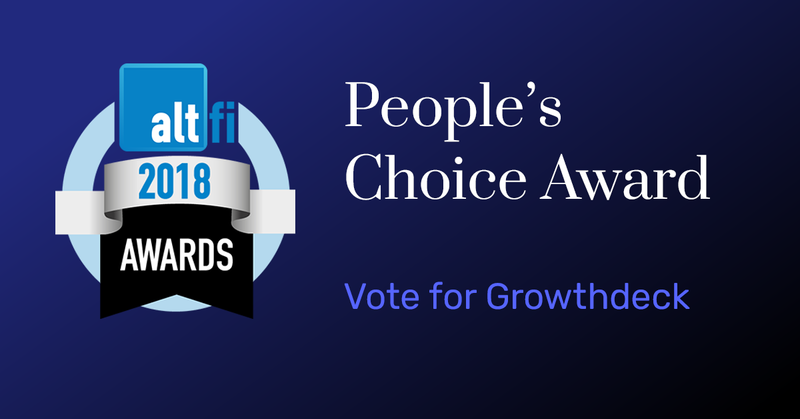 Voting is now open for the People’s Choice Award at the annual AltFi Awards – please consider casting a vote for us here. The awards celebrate the rapidly-growing world of alternative finance and fintech, with categories including Alternative Finance Platform Of The Year, Digital Bank Of The Year, and The One To Watch. We previously won an ‘Up and Coming’ Award from AltFi and we have come a long way since. Voting only takes a few moments and we would really appreciate your support. Voting closes for the People’s Choice Award in early February 2019 (all other categories/winners are decided via a judging panel), with an awards ceremony held later in the month. Last but not least - good luck to all the other entrants!